This is one of the classic, old skool, historical romances. I bought it years ago, and had forgotten about it when I found it in the wardrobe at my mum's place. (My wardrobe there is BIG and filled with books. )I know from experience that some books doesn't survived the test of time. But I was happily surprised when I started to re-read this one.I fell in love with the characters, especially Angel and Cassie. Cassie's nosiness and tendency to poke her nose into other people's business made me laugh. 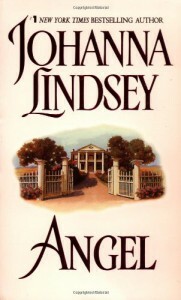 Angel had a core of honor that I liked, even though I had to blink away tears when .he spoke about his childhood.And the setting.The setting felt well researched. It was interesting to get a glimpse of the wild west, and one that at least felt believable. In fact, it felt so believable that I sometimes could feel the burning sun, and taste the dust in the air.The plot was fast paced. I admired Cassie for her refusal to back down, and do the sensible thing which would have been to head back to Wyoming. I loved how Cassie's stubbornness kept Angel on his toes. There were plenty of plottwists that took me by surprise, yet in hindsight they made sense.I enjoyed this book, for ¾ of the book ,but after awhile I started to get a bit annoyed, since it felt like their road to their HEA was stretched out a bit too long. But it was a good read, and one I plan to re-read.